It’s hard to know where to begin when writing about Iceland. I think I’ll leave the scenery for my next post and write about what’s been uppermost in my mind and our conversations when we’ve not been staring, goggle-eyed, at what’s around us. It’s the thing you can’t help but notice here and it’s something that comes up in most conversations and definitely at meal times – the cost of being here. Food is the most noticeable thing because you’re shelling out for it several times a day. We had the buffet at the restaurant over the road from our hotel two nights ago and it was $52 AUD each (it’s handy that Krona converts to AUD of you drop two zeros). That was $52 for a bowl of soup, a choice of 4 kinds of fish, 2 lamb dishes, salad and some potato bake. No dessert, no drinks. We did pilfer a few chocolates from beside the coffee and tea stand. Tonight’s hotel is $55 for a buffet also. We’ll be having jam sandwiches in our room. 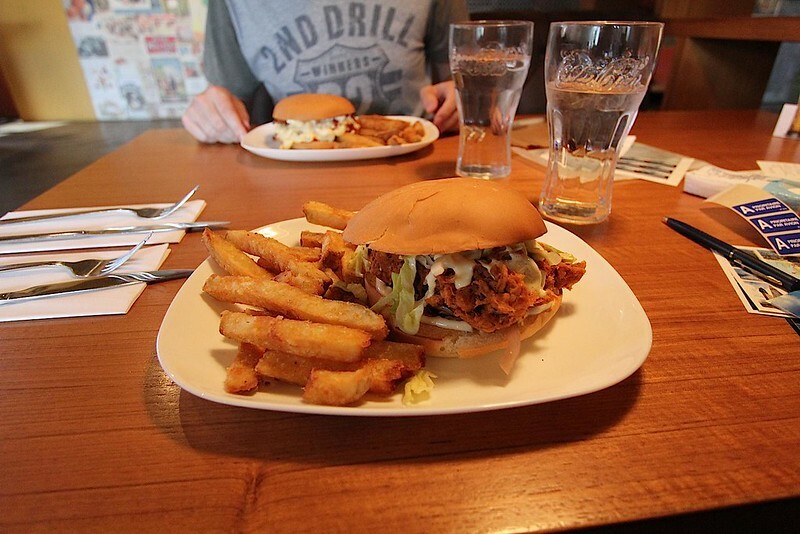 On our first full day here we had lunch at ‘The Roadhouse’, an American style diner in Reykjavik. The food was fantastic but my pulled-pork burger and chips was $18. The most expensive burger on the menu was $35. We were both a bit shell shocked. Luke’s burger had macaroni cheese in it along with all the regular stuff. Win! Petrol here is about $2.50 AUD a litre. Fortunately we’re driving a Micra so it’s not as bad as it could be, but everything here except seeing the amazing natural wonders costs a bomb. I thought it might be handy for people who are thinking of coming here to know what we’ve spent and a few ideas on cost cutting. Firstly, we booked a self drive tour. Since we needed an automatic that put up the price by a couple of hundred dollars, but for all our hotels (pretty basic, half are shared bathrooms but all have private rooms) ad the car hire it was about $1400 each. I’d say we’ve spent, on average, about $50 per day on food. We’ve had a few expensive meals, but we’ve also had breakfast included each day (and a sneaky person can make themselves up a take away sandwich), which can fill you up til mid afternoon if you go heavy on the cold meats and eggs. Then we share a plate of something or buy pre-made rolls for lunch (they’re about $7 each and some are nice and others are awful but there’s rarely much choice, particularly at the cafes that are at tourist attractions – go for petrol stations if you can) and last night we ate corn chips and salsa dip for dinner with a movie in our room. Except for mixers with our spirits we’ve been mostly drinking water from bottles we’re refilling at our hotels. If you’re traveling to Iceland I’d highly recommend filling your suitcase with long lasting food (like fruit and nuts, tinned tuna, etc) so that you’ve got snacks until you find somewhere you want to eat. Not having snacks the first few days meant that we were pretty desperate by the time we found somewhere and felt that we had to pay whatever they asked. If you can spin out your bought meals with some groceries you’ll save heaps. For example, today I got a fishburger and chips and Luke made chip sandwiches using bread from the supermarket. That burger, btw, was $14. I think my main recommendation, if you like a few drinks, would be to use your duty free allowance before you leave wherever it is you’re traveling to Iceland from. Use it good. Iceland Air don’t seem to care about you having a bag of duty-free as extra carry-on and you could probably get away with bringing in several bottles if you so chose. We bought two one litre bottles and were enormously glad we did when it turned out that one small bottle of cider was $10 – same for beer or a small glass of wine. And the wine was awful. Alcohol is also quite hard to get. There’s only 12 government-owned stores in the capital and I’ve not seen any anywhere else. Our hotel today sells small bottles of beer, wine and cider from a fridge by the reception desk but that is the only time I’ve seen it for sale outside a restaurant in the last 4 days. I wanted to have a drink somewhere scenic on midsummer’s night and was very, very glad I’d prepared everything much earlier. As to buying stuff other than food, booze and accommodation, forget about it. I had a vague idea about buying a nice wooly jumper or hat or something as a momento but the choice is between the ubiquitous so-scratchy-I-think-the-sheep-grow-steel-wool jumpers and lovely angora clothing, both of which are INSANELY expensive. I found a nice sweater dress, simple and black – $328. The average wooly hat is around $60 but with fur you’re looking at around $400. That’s right FOUR HUNDRED DOLLARS. Just buy a postcard and be done. I’d say our trip has probably cost us around $2500 each for the 9 days. You could possibly do cheaper accommodation by camping every second night (but you’d want to pray for good weather) as camping seems to be free here (don’t quote me on that) and buying all your food from supermarkets but even if you do it fairly budget like we have it’s never going to be a cheap place to visit. After all this whinging though, it’s still been TOTALLY worth it. Okaaaay. I think I made the right choice not coming on this trip. I have put it off a couple of times because of the expected cost and this has confirmed it. I’ll make it one day, just not l. A trip where my weekly budget is around $400 😉 Post more photos so I can live vicariously through you! Heh, done! I’ve taken so many photos it’s really hard to work out which to post.. and then the internet is so awful I can upload one every 5 minutes… argh! Yeah, it’s turning out to be more expensive than I thought. Luckily Luke and I don’t mind living on doritos and salsa for one meal a day;). I have certainly heard that – although I’ve never been to any other Scandinavian countries. I don’t know what their deal with alcohol is, either because I’ve heard it’s difficult to get and taxed astronomically in most northern countries. It’s hard to say whether people here have a high quality of life.. if quality comes from choice (which I don’t necessarily agree with) then they most certainly do not. The range of stuff in the supermarkets here is pitiful. But they have good health care and education… I haven’t met anyone yet who has traveled beyond Denmark though. And I have absolutely no idea what people who live here do for fun apart from skateboard, knit and ride bicycles… something to find out! Well the pictures you’ve posted above certainly make the place look breath taking, but after reading this post I’ve now got zero desire to go there, they are seriously taking the piss with prices like that and there are a hundred other beautiful places I could go and not get raped in the wallet. There’s a 25% tax on pretty much everything here, which is supposed to have been to help the country recover from the economic crash but people I’ve spoken to say that they don’t know why prices are so high, considering that the country seems to have recovered now. I think they’re really missing out on a lot of tourist dollars because they’re pricing so many people out of coming here. Hopefully they’ll realise this and it will change. On the plus side, even though it’s the high season right now there’s no sense of anywhere being overcrowded or over run by tourists. It is certainly the most stunning country I’ve ever visited though and I’m glad we came.Definitely a once in a lifetime trip though!